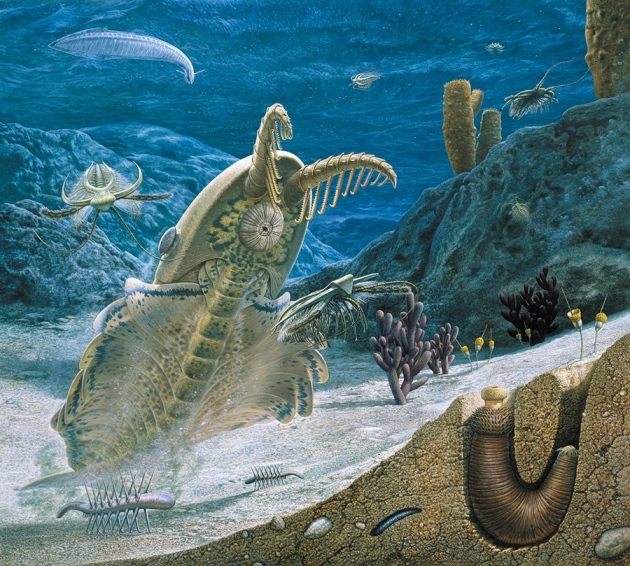 Did the First Life Emerge on Land or in Water? We once heard somebody say "Yo' mama's so old, her favorite food is primordial soup!" Now, given what we know about the origin of life on Earth, we're pretty sure that's impossible. But as it turns out, there's already a ton of arguing about the nature of that primordial soup, and not a lot of consensus — we don't even know if it was on the surface of the very first continents or if it was deep beneath the ancient oceans. Whether or not somebody's mama was there too is probably up for debate as well. Conventional wisdom dictates that life began at the bottom of the ocean, right? After all, when you think of the very first, very creepy complex life on the planet, you think of weird critters swimming through bizarre oceanscapes, right? Well, that could be correct — but it could also be completely wrong. There are good arguments for thinking that life began in the ocean and there are good arguments that it began on land, as well. Many biologists believe that life could have only started at the bottom of the ocean, and they make some compelling points. First of all, the land was not a very hospitable place when the first life forms popped up. It was constantly awash in deadly UV radiation from the sun, which isn't the friendliest environment for a brand new baby bacteria. Instead, says the oceanist faction, those early single-cells formed around the nutrient-rich jets of water from deep-sea hydrothermal vents. They'd be safe from the sun down there, and they'd have plenty of tasty minerals to munch on to boot. And that all makes sense. But other scientists say that the very first organisms must have been land-lubbers. And they're not worried about the damage that UV radiation could have caused. Instead, they say, it's the deep ocean that's the extreme environment. On the land, there would have been mineral-rich hot springs and a smorgasbord of gases. To back that claim up, they look at what's contained within surviving cells themselves: a lot of potassium and not a lot of sodium. The thing is, at the bottom of the ocean the ratio of those two chemicals is completely switched. And others say that the very UV radiation that scares some microbiologists could have been the catalyst for melding those chemicals into a self-replicating code. Again, this is something that most people think they know the answer to, but it turns out there's a lot more argument than you might think. Since the Earth was already about a billion years old when the first bacteria began to pop up, it's generally believed that it took about that long for chemicals to finally arrange themselves into self-replicating strands of DNA. But a new study published in Nature suggests that instead of slowly accumulating over the course of a billion-plus years, single-cell organisms might have arisen all of a sudden, taking just a couple million (or even tens of thousands) of years. What's more, it might have done so simply as a matter of course, the natural result of the particular chemical makeup of the planet in combination with its wet and rocky makeup and its distance from the sun. They're not the only ones to think so either. Earlier in 2017, one physicist made waves when he claimed that life was as unsurprising as "rocks rolling downhill." In other words, there might be as many lineages of life as there are Earth-like planets — that's 40 billion in the Milky Way alone. For an engaging, approachable introduction to evolution, check out "The Greatest Show on Earth: The Evidence for Evolution" by evolutionary biologist Richard Dawkins. The audiobook is free with an Audible trial. We handpick reading recommendations we think you may like. If you choose to make a purchase, Curiosity will get a share of the sale.